Heat pumps are electric water heaters that provide hot water very efficiently in most climates, saving up to 78% over a standard resistive element heater. You can save another few percent with the addition of a Valvecosy (an insulating cover) on the pressure and temperature relief (PTR) valve. Valvecosy is available from the ATA shop. This article was first published in Issue 139 (Apr-June 2017) of Renew magazine. One of the biggest energy users in any home is water heating—it can account for around 21% of total energy use (on average, according to YourHome), at a considerable financial cost each year. Water-efficient appliances are one way you can reduce energy use—for example, you could replace an inefficient showerhead (e.g. some use 20 litres per minute) with the most efficient, which uses less than 5 litres per minute, saving water and water heating energy each time you shower. But far greater energy reductions are possible if you replace a conventional water heater with a heat pump, solar thermal or solar electric system. Such systems have the added advantage of reducing your greenhouse gas emissions. For example, for an average family the reduction can be as much as four tonnes of CO2 per year—the equivalent of taking a car off the road! From an efficiency and environmental point of view the future of household energy is electric. The rise of rooftop solar and the availability of GreenPower means that households can use 100% renewable energy to run their appliances, including hot water systems. This means we don’t cover efficient gas hot water options such as gas instantaneous in this guide, although the solar thermal hot water systems listed do have gas boost options. Gas used to be seen as the cleaner energy choice, at least when compared with burning coal, but there are better non-gas appliances available to households now. And changes in the gas market mean gas prices are on the rise. Replacing a hot water system with a modern solar thermal or electric one is often the first step in disconnecting from the gas grid, and the associated costs and greenhouse gas emissions. We cover systems designed for household hot water that can run from renewable energy, including electricity, and ambient and solar thermal heat. These include heat pump, solar thermal, electric instantaneous and the newer kids on the block, PV diversion and direct PV water heating systems. Heat pump systems can be designed for other purposes in the home such as pool heating or hydronic heating, but these are out of the scope of this guide. A heat pump moves, or ‘pumps’, heat from one medium into another. 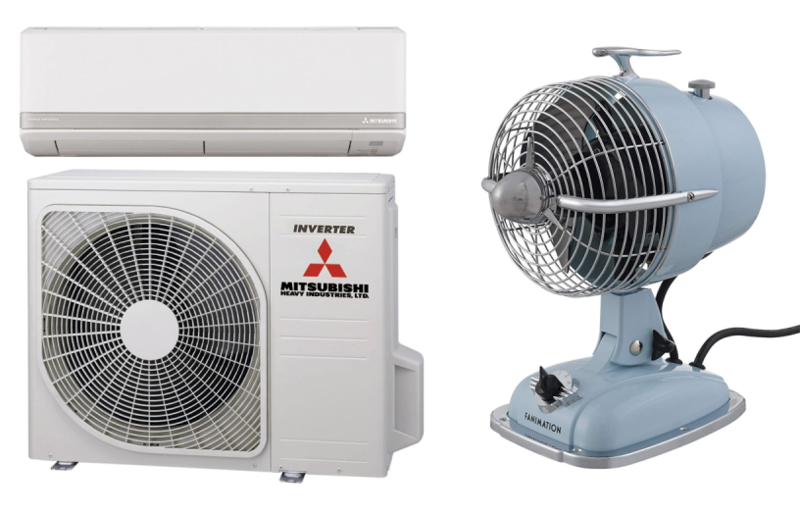 Air conditioners and refrigerators are the most common forms of heat pumps. Heat pump hot water systems concentrate low-grade heat from the air (which is why they count as renewable systems for STC rebates) and dump it into the water storage tank. They are much more efficient than conventional resistive electric water heaters (although they do still use electricity to operate): compared to resistive heaters, they are capable of reducing year-round energy requirements for hot water by at least 50%, and by as much as 78% depending on the climate, brand and model. The most common systems are air-source heat pumps where heat is extracted from the air. Ground-source heat pumps (which use buried coils to take heat from the ground) can be even more efficient than air-source heat pumps and might be an option if you’re considering both water and space heating systems. They are a great deal more expensive than air-source heat pumps though, so often aren’t viable. 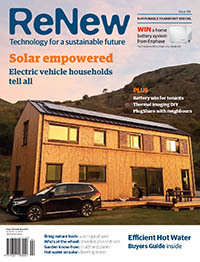 We looked at ground-source heat pumps in Renew 112. To split or not: Heat pump hot water systems are configured as either one-piece (integrated) or split. In an integrated system, equipment such as the evaporator and fan is mounted on top of or beside the tank and integrated into a single unit. In a split system, the heat pump mechanism is housed in a separate unit plumbed to the tank at installation time. Depending on the design, the pipes between the tank and the external unit will carry either refrigerant or water. An integrated unit has the benefit of simplicity of installation and compactness, whereas a split system allows greater flexibility in locating the two components. For example, you could locate the tank indoors and the heat pump mechanism outside on a wall. Performance: Heat pumps are much more efficient than conventional resistive electric water heaters. Typical heat pumps have a coefficient of performance (COP) of around three: these are three times as efficient as a resistive unit; for every unit of electricity used, they move three times this much energy into the water. However, it should be noted that COP varies with ambient conditions; when the air temperature is higher, the heat pump can more easily draw the heat energy from it. The way COP is measured and reported is often not consistent, so currently the best objective performance indicator is the number of STCs the system earns in a given climate zone (see the ‘Which system suits my climate’ section). Refrigerant: The global warming potential (GWP) of refrigerants used in heat pump systems is often very high, which becomes a problem if they leak or are dumped illegally. This is an issue broadly for the refrigeration industry; the simplicity and size of domestic heat pumps means it is less of a problem for them. Most of the current generation of refrigerants are hydrofluorocarbons (HFCs) which have very high GWPs; e.g. many systems still use refrigerants such as R134a which has a GWP of 1430. Increasingly systems are becoming available that use low-GWP refrigerants such as hydrocarbons (e.g. propane, or R290, with a GWP of 3.3) or carbon dioxide (R744), with a GWP of 1 (Sanden heat pumps use this). Australia has signed up to a phase-down of HFCs which will accelerate this transition. Boosting: Heat pumps are designed to run whenever the tank temperature falls below a preset level (e.g. 60 °C). Some heat pumps struggle in air temperatures approaching freezing, and so may use a resistive electric element as a booster in these conditions. If you live in an area that sees regular near-freezing temperatures, look for a system that will operate under such conditions without the need for a resistive booster. You may also have your heat pump on a timer, so that it can make use of daytime PV generated solar, for instance. However, extra hot water may be needed at other times, so most timers have the ability to be overridden for just such requirements. Noise: Like the outdoor unit of an air conditioner, heat pumps make some noise (although some are noisier than others—check the decibel rating), so thought should be given to their location. Avoid fitting them close to bedrooms unless they’re on a timer and only run during the day. Rate of recovery: This refers to how quickly the heat pump can reheat the water in its tank to a particular temperature. If you are big water users or have guests staying regularly, you should buy a unit that has a relatively fast rate of recovery. Electric diversion systems use excess energy from existing grid-connected solar panels to heat water in an electric storage water heater. When electricity starts flowing out to the grid, the controller turns the diverter on and feeds that energy into the water heater. For example, if your PV system is exporting 500 watts of excess generation to the grid, the diverter will start feeding that 500 watts to the water heater instead. Diverters are generally fully variable in their outputs: they don’t just turn a load on and off at full power. They match the power fed to the water tank element with the excess generation in close to real time, measuring potential export and adjusting accordingly. 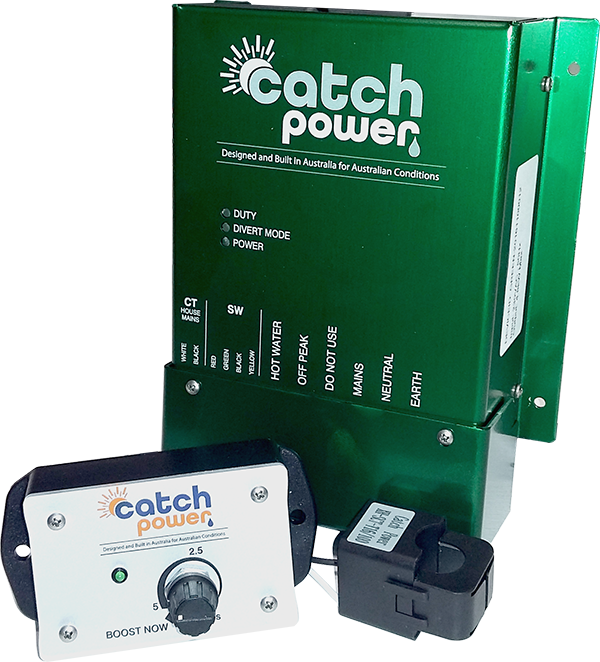 Diversion systems, such as the Catch Power Green, send excess solar generation to a hot water system, rather than into the grid, and can greatly reduce water heating costs. Here you can see the main diverter unit (the big green box) and the current flow sensor (bottom right) and its associated transmitter with boosting control. Some diverters, such as the AWS SunMate, have adjustable thresholds which enable them to divert only when the excess generation reaches a desired level. This is useful when the load is a heat pump water heater rather than a resistive element. The threshold can be set to be equal to the average running power of the heat pump, so that the heat pump runs from excess solar generation whenever possible. Boosting times will need to be included (usually programmed into the diverter), for days of low generation when the threshold is never reached. Installing a diverter usually means that a clip-on sensor must be attached to the main lead into the home’s switchboard. This sensor talks to the diverter either via a wireless link, a hard-wired cable or even via powerline communications, where data is sent over the mains cables in the home (such as with ethernet over power, or EoP networks, which are common in homes now). Generally, an electrician is required to install a diverter. The advantage of using a diverter is that, rather than getting paid just a few cents per kilowatt-hour by the energy company for your excess generation, you get to use it on-site, offsetting energy from the grid that would cost you a great deal more. Diversion is now becoming a feature of some grid-interactive inverters, although inverter capabilities in this regard are generally more limited—often being a simple on/off output once a set export threshold is reached, with no ability to vary the output into the load. However, as PV diversion becomes more popular as a means of using excess generated energy on-site, we expect to see many, if not most, grid-interactive solar inverters with some form of diversion capability in the near future. The average cost of a diverter is around $900 or so, depending on features, although units range up to around $1700. As they become more popular, prices will come down, but for now you need to weigh the extra cost of the diverter against using a simple timer to run your heater during the day, although a timer gives far less flexibility. In such systems, solar PV panels are connected directly to a traditional electric resistive water heater via a maximum power point tracking controller/inverter (which ensures you get the most energy possible from the PV panels). The PV panels may be connected to the bottom element in a two-element tank or the single element in a standard single-element tank. However, at present, very few solar installers/electricians will have wired such a system, so you will need to use the installer recommended by the system supplier. When using direct PV systems with a mains pressure tank it is important that the controller is also either an inverter or produces chopped (regularly interrupted) DC so that the element is fed power that allows any arcs to extinguish—the wiring rules require that the over-temperature thermal cutout (OTTC) is wired in series with the element. Direct PV systems that produce continuous (non-interrupted) DC output must not be connected to a mains pressure tank, only open-vented tanks, as these don’t require an OTTC. Any direct PV systems that produce chopped DC, where the DC current is regularly electronically interrupted to allow arcs to extinguish, can be used with an existing AC rated OTTC if the system conforms to IEC 62109. An example of such a unit is the Plasmatronics PLW. Similarly, using pure un-chopped DC in standard AC thermostats will cause excessive arcing which may burn the contacts. While some direct PV systems are sold as a controller and you supply your own solar array, others (such as the Easy Warm Hot PV system) are sold as a complete package of solar array and inverter to simplify installation and ensure the system complies to the safety standards. Direct PV systems can cost as little as $300 for a simple DIY controller, through to several thousand dollars for a complete package. Boosting: For days with inadequate input from the solar PV, boosting will be required, just as with a solar thermal hot water system (see below). Boosting might use the electric element in the tank for overnight heating from mains grid power (via the settings on the diverter or a separate boosting timer) or on-demand boosting from an instantaneous water heater. It is important to consider how much boosting you are willing to pay for over winter. Water heating requires more energy input in the cooler months due to higher tank losses (heat loss rate is proportional to the temperature difference between the tank and the ambient air) and higher hot water demands. Plus this is the time of year when solar input is lowest. Consider whether it is worth increasing the size of your solar system, especially if you are already upgrading or adding a direct PV array, to cover some of this extra energy requirement. Your energy bills should have the export component listed, so compare this figure to what your expected water heating usage will be (this might be listed separately on your bill if you have an off-peak tariff for water heating) to get an idea of just how much you are likely to gain from a diversion setup over winter. Also consider appropriate boosting times, especially if you use most of your hot water at night. If you have a day of low solar input, but the next day is forecast to be sunny, and will therefore provide all the energy needed to reheat the hot water tank, you don’t want the booster running and preventing the PV from heating the water the next day. One solution is to have the PV heating the bottom element of the tank, while the boosting only heats the middle or top element, leaving plenty for the PV to do the next day, while still supplying adequate hot water. Everyone’s hot water usage patterns are different, as is the output from PV systems, depending on time of year, local climate and personal preferences, so you may need to work out a boosting regime that works best for you. Just make sure the boosting element is on a timer so that you can experiment to find the right balance without needing an electrician. Usually called solar hot water, a solar thermal hot water system uses heat directly from the sun and consists of a hot water storage tank connected via pipework to solar collector panels. These collector panels are placed on a (preferably) north-facing roof, although a west-facing roof will also work well in many cases. The tank can be situated immediately above the panels on the roof (a close-coupled system), above and a small distance away from the panels within the roof cavity, or at ground level (a split system). For split systems, a pump and controller are required to circulate water through the panels. The collectors are usually mounted at an angle of no less than 15° from the horizontal (the minimum angle for close-coupled systems to ensure correct thermosiphon operation), although often a lot steeper to optimise the system performance for winter. 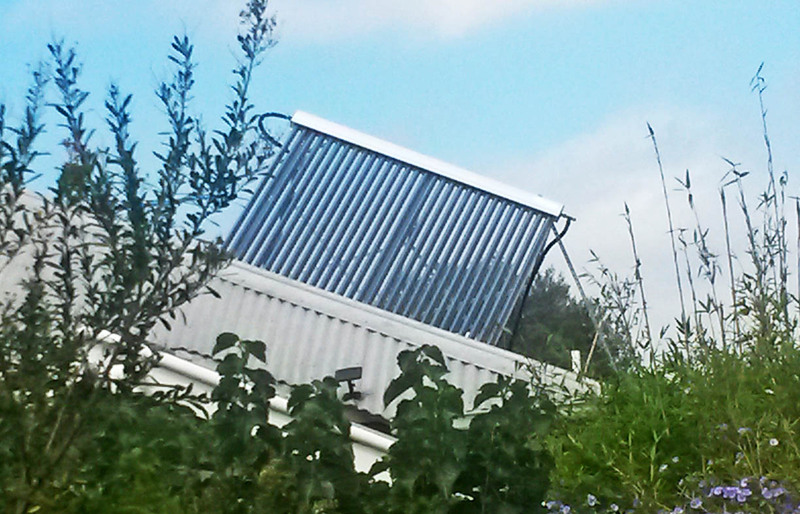 Even a non-ideal roof can take a solar thermal collector with the right frame. As the sun shines on a collector panel, the water in the pipes inside the collector becomes hot. This heated water is circulated up the collector and out through a pipe to the storage tank. Cooler water from the bottom of the tank is then returned to the bottom of the collector, replacing the warmer water. Some systems don’t heat the water directly but instead heat a fluid similar to antifreeze used in vehicle cooling systems. This fluid flows in a closed loop and transfers the collected heat to the water in the tank via a heat exchanger. Evacuated tube collectors either heat the water directly or uses copper tubes called heat pipes to transfer the heat to the tank or a manifold at the top of the collector. To split or not? : For close-coupled (non split) systems, the circulation of the water through the panels and tank occurs naturally as the heated water rises, by the process of thermosiphon. With no pump required, these systems are simpler than split systems, with less maintenance required. However, the storage tank does need to be above the collector panels, and the roof must be able to support the full weight of the tank. In split systems, a pump and a differential temperature controller are used to circulate the water. Split systems have a slimmer roof profile and are more convenient should tank maintenance be required, but the pump and controller do add complexity and have more potential for failure. 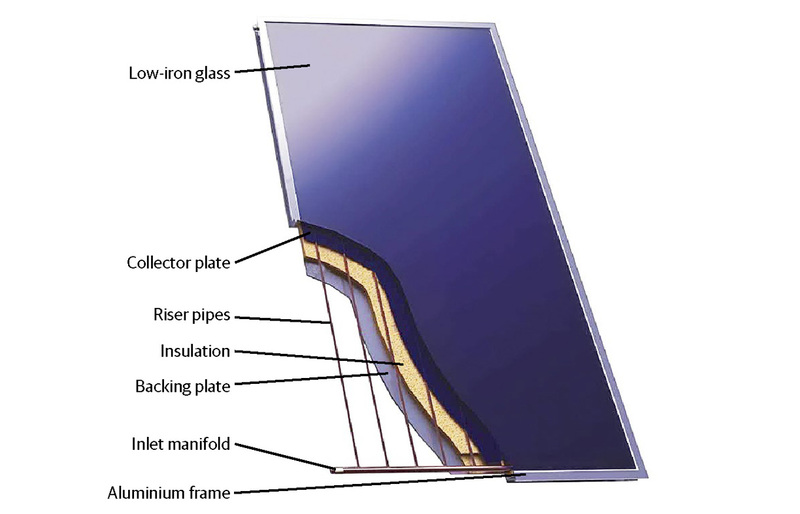 Collector types: There are two common types of solar thermal collector panels: flat-plate and evacuated tube. Which type you use depends on personal preference and your climate. Evacuated tubes tend to work better in the cooler months in colder climates, but in warmer climates, either type of collector will perform well. If selecting an evacuated tube collector, check to see how easily tubes can be replaced if broken. Many collectors can have tubes removed without having to drain the collector or affecting operation of the rest of the system. Flat-plate collectors use a network of copper pipes bonded to a collector plate. This is backed by a layer of insulation and a backing sheet. A sheet of glass covers the panel and an aluminium frame encloses the entire panel. Boosting: Virtually all solar thermal hot water systems on the market incorporate some form of boosting for times of insufficient sunshine. Electric elements in the tank are the most common boosting option. They fit in well with cheaper night-rate tariffs and are cheaper than gas boosters. If you opt for electric boosting and plan to buy accredited GreenPower, make sure that your night-rate electricity is also GreenPower. It is even possible to have a solar thermal hot water system that uses a heat pump for boosting, giving you the lowest energy use water heating system. However, you would need to add a bolt-on heat pump system to a regular split system tank and the added cost may mean this is not economically viable. Gas boosting is now mostly in the form of instantaneous booster units that are connected to the outlet of the storage tank. If water from the tank is below the required temperature, the gas booster fires up, heating the water to the desired temperature. The advantage of this system is that there are lower standing heat losses compared to a system where the entire tank is heated to full temperature. Instantaneous gas heating may, however, require a higher capacity gas line as it burns a lot of gas to heat water quickly. Solar compatibility requires the booster to be able to operate with a low temperature differential between the hot water coming in from the solar system and the final hot water temperature desired at the taps. Some gas instantaneous heaters are designed specifically for solar thermal hot water boosting, and come as a package with the system. While gas has previously been thought of as a fairly good option environmentally, that view has changed as the full life cycle analysis and resulting greenhouse gas emissions from gas have become more fully understood. In many cases, electric boosting is likely to be the greener option, especially if it is 100% GreenPower or locally generated renewables. There are a small number of instantaneous electric water heaters that can be used as solar boosters, such as the Stiebel Eltron DHE AU series, so if you have a suitable electrical connection, this might be a good option. In rural areas where firewood is plentiful, the hot water system can be boosted by a solid fuel heater or a slow-combustion stove, but this has greenhouse gas and air quality considerations. Using this method requires some special system and plumbing considerations. A slow-combustion heater is an uncontrolled heat source and any hot water tank connected to it must be open-vented, not mains pressure. It is highly dangerous and illegal to connect a mains pressure tank directly to an uncontrolled heat source, although you can still add solid fuel boosting if you convert the mains pressure system to gravity-feed by adding a header tank. Frost protection: All manufacturers offer frost protection on at least some solar thermal hot water models. This is important for anywhere that a frost may occur. For close-coupled systems there are several frost protection methods. Many systems use a heat exchange fluid which flows through the panels and into a heat exchanger in or around the storage tank. The fluid in this outer circuit contains propylene glycol, an antifreeze additive, and does not freeze under any conditions likely to be experienced by the collectors. However, the fluid level in this circuit must be checked regularly and replaced after an interval as recommended by the manufacturer. This fluid is more slippery than water and has been known to leak out through the panel connectors. Owners should look out for this and replace the seals and fluid before irreparable damage is done to the panel. In a split system using flat-plate collectors, the controller will usually have a freeze-protection mode. It will turn the pump on when the sensor at the top of the collector shows a temperature of 5 °C to pump warm water from the tank through the collector, preventing freezing. The pump will only run until the top of the collector is warmed by the water, so only a small amount of heat is lost with each pump cycle. Evacuated tubes often use heat pipes to transfer the heat from the tube to the tank or collection manifold. As this type of evacuated tube does not contain circulating water, there is none to freeze. In frost-prone and colder areas, a heat pipe evacuated tube system should be considered. Another method is the use of dump valves. These are only used in flat-plate close-coupled systems that use water in the panels instead of a heat exchange fluid. The valve works by opening as the water temperature approaches freezing, allowing warmer water from the tank to enter the panels, which also causes the valve to reclose. This method is not common nowadays but may still be found on lower cost or direct-import systems. Temperature control: Under the plumbing code AS3500.4, it is a requirement that all water heaters connected to an uncontrolled heat source, such as solar collectors and wood stoves, must have a tempering valve fitted. This valve limits the maximum temperature for hot water to the bath, shower or hand basin to a maximum of 50 °C by mixing cold water with the hot water coming from the solar water heater. No solar thermal water heater should ever be installed without a tempering valve. However, PV diversion and direct PV systems use the water heater’s original thermostat (or temperature monitoring in the controller) and so operate like a regular controlled heat source system. It is possible to retrofit an existing electric storage hot water system to use solar thermal heating, provided it is in good condition (five years old or less). For a split mains pressure system, a fitting can be installed on the cold water inlet. It is not advisable to connect solar to gas storage hot water systems because they are designed for the gas to reheat the water as soon as some is used, so the sun can’t really contribute any heat. 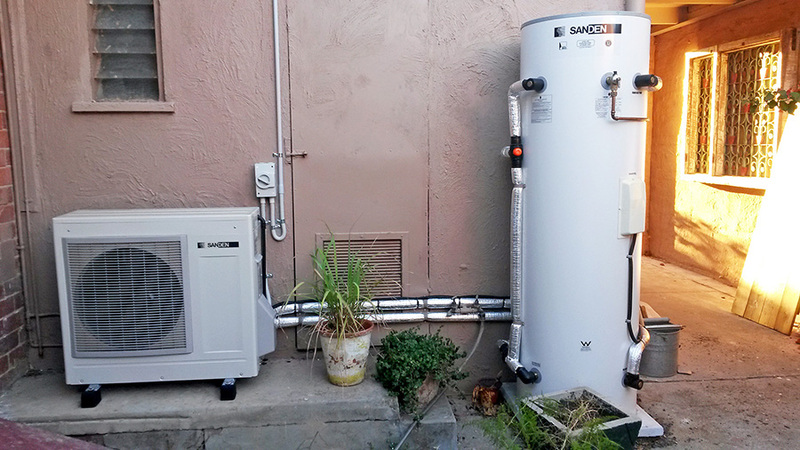 There are add-on heat pump systems that can be connected to an existing gas or electric water heating tank. The original heating source (gas or electric element) is disconnected and the heat pump system takes over all heating, greatly reducing the heating energy requirements. Almost any hot water storage tank can be retrofitted using these systems. The Siddons Solarstream Bolt-on heat pump is an example of such a system. It should be noted that STCs and other rebates are invalidated by retrofits. If looking purely from a cost perspective it’s usually advantageous to install a complete new system as the rebate more than covers the cost of a new tank. Of course, for PV diversion and direct PV systems, you need an existing electric storage water heater (or heat pump unit) in good condition, preferably a tank with both top and bottom elements, with the solar powering the bottom element and boosting powering the middle/top element. The installation of any system should be carried out by appropriately qualified and experienced tradespeople to make sure it is properly sized and installed. The Clean Energy Council’s solar hot water and heat pump fact sheet has some useful tips and an installation checklist. The ATA, ReNew’s publisher, is also compiling a list of questions to address quality considerations and installation. The warranties offered on heat pump and solar hot water systems vary from one manufacturer to another and should be carefully scrutinised when buying a system. Generally, the tanks (and collector panels for solar thermal systems) are warranted for five to ten years while the associated valve work will carry a 12-month warranty only. Read the warranty conditions carefully, especially those concerning labour. 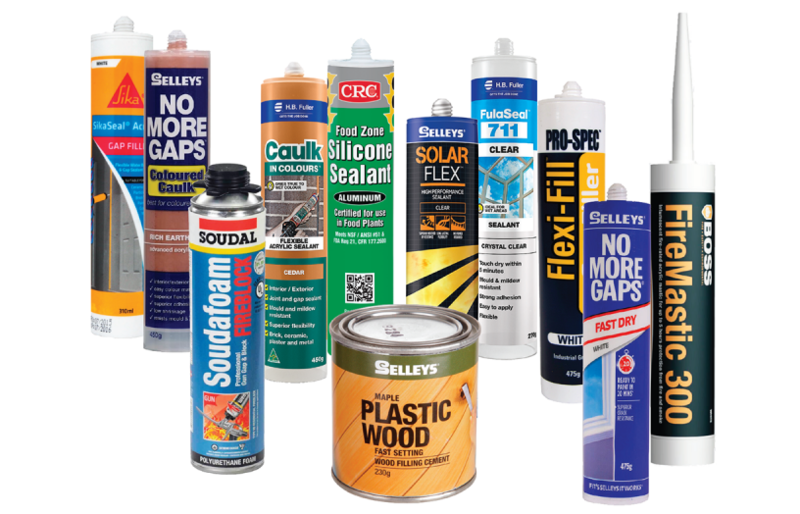 Some warranties are conditional on installation by appropriately qualified personnel, regular servicing and water quality. PV diverter warranties vary, but you should look for at least five years, much as you would with a PV inverter. If installing a new storage tank at the same time, again look for a long warranty, but don’t sacrifice better thermal performance for the sake of an extra year on the warranty. For direct PV systems, you will be dealing with the PV panel warranties—most panels come with a performance warranty of at least 25 years. For more information see the PV panel buyers guide in ReNew 134. Solar, heat pump, PV diversion—which one suits my situation? A hot water system is a big investment and one that won’t be replaced too frequently, so a household should consider a number of factors when making a choice. The main considerations are the environmental benefits of a system, how a water heater works with their existing power supply, the upfront cost and the cost to run, along with other factors such as reliability, climate and complexity of installation and the system. What about the economics for a home with existing PV? With lower feed-in tariffs in place there is greater value in using your solar electricity on site rather than exporting it to the grid. The biggest opportunity lies in shifting a large energy user, such as water heating, to solar generation hours via a heat pump or a traditional resistive hot water system. How can I decide between a heat pump and solar thermal hot water? Each type of system has advantages and disadvantages. Solar thermal systems require either a strong or reinforced roof for close-coupled systems, or require regular pump maintenance for split systems. Integrated (one-piece) heat pumps, being fully ground-mounted and not having water pumps, require neither of these. Split system heat pumps usually have water pumps for circulation between the compressor unit and the tank, but have the advantage that the tank can be inside while the compressor is outside—reducing heat losses from the tank in colder climates and making for flexible installation and ease of adding extra insulation. Being refrigerant-based systems, heat pumps can require regassing from time to time, although if the system is properly sealed this should not occur any more than every 8 to 10 years. After all, how often do you have to regas your fridge or air conditioner? Heat pumps can be run on a timer, either to make use of low off-peak tariff prices or to run more efficiently during the day due to higher ambient temperatures or to use excess solar PV—they are more flexible than solar thermal water heaters in this respect. However, heat pumps must always use electricity, even during summer, whereas solar thermal systems may be completely solar-powered during the warmer months—and in warmer climates, this can be most of the year. In cooler climates, they can still provide good savings, particularly if usage is well managed to suit the solar heating cycle. In situations where shading is a big problem for solar thermal systems and drastic tree surgery is not an option (or shading is caused by the neighbour’s house), a heat pump may be the best option. There can be an argument for using heat pumps based on a more even energy usage profile over the year. 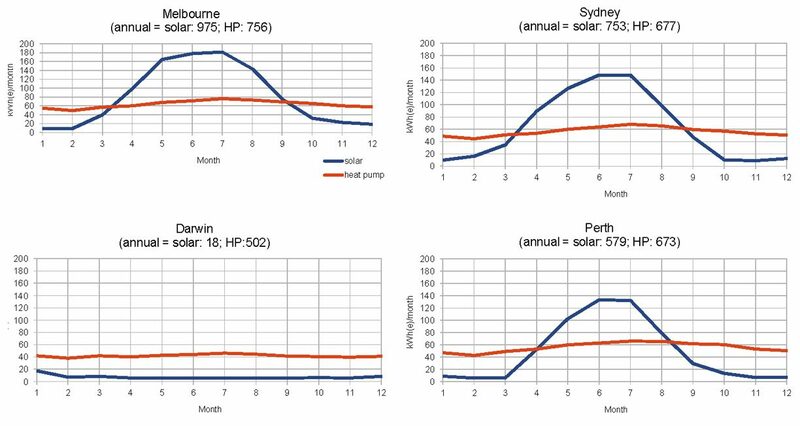 Comparative energy use examples of heat pumps versus boosted solar thermal can be seen in Figure 1. Figure 1. Beyond Zero Emissions has modelled the case for heat pumps versus solar thermal boosting requirements (see www.bit.ly/BZEZCABP). As can be seen, the energy required for heat pumps is quite flat throughout the year compared to solar boosting, which requires considerably more energy in the cooler months. For ATA graphs modelling energy use of heat pump versus resistive hot water systems, see the online version of this guide. When would I consider direct PV? Direct PV is a bit like an off-grid system dedicated to heating water, so only works for specific situations. If you’re already on solar then it’s probably more efficient to use that power to run a heat pump or resistive electric system than set up a new stand-alone system dedicated to water heating. However, if you’re grid-connected and can’t add solar panels because you’ll lose your feed-in tariff, then you might consider a direct PV option. And off-grid households with limitations on how they can expand their solar electricity system might consider direct PV. You might consider a direct PV or a PV diversion system if you have an existing electric storage water heater running from peak rate power (there may be no off-peak rates available) or where installing a solar thermal system would result in long pipe runs or cause other problems. The PV array doesn’t need to be close to the water heater storage tank, as the connection between the PV array and the tank is an electrical one, not hydraulic, so energy losses are minimal. Which system suits my climate? Certain types of hot water systems are more suitable in some climate zones than others. For example, evacuated tube solar thermal systems usually work better than flat-plate systems in colder areas that see heavy frosts and/or snow. In tropical and subtropical areas, both types of system work well, although in warmer regions evacuated tubes can over-produce and the system must be set up to cater for this. Figure 2. Indicative climate zones for the testing and certification of solar thermal and heat pump hot water systems. 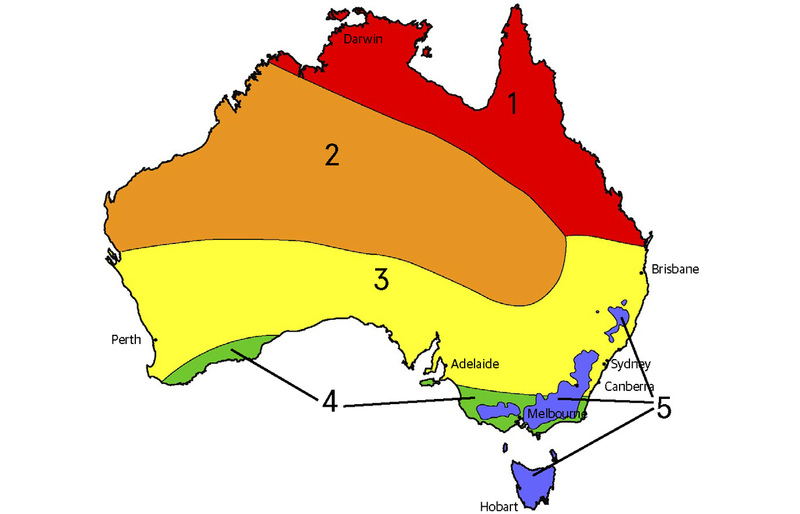 Note that Zone 5 only applies to heat pump systems; for solar thermal systems, Zone 5 corresponds to Zones 3 or 4. Melbourne is in Zone 4 for both solar thermal and heat pump systems; Tasmania is in Zone 4 for solar thermal systems, but Zone 5 for heat pumps. Direct PV and PV diversion system performance relies on the available output from the PV array, which relies directly on solar insolation. For diversion systems, this depends on what other loads are using electricity in the home during daylight hours, so it doesn’t just come down to climate. Looking at your energy bills and seeing how much you export each day or quarter, will give you a good idea of the ability of the PV array to provide hot water. Whether this amount will be enough to provide the majority of your hot water needs (you should be looking at producing more than 50% from solar, on average), will depend on your hot water usage. For more information on calculating your hot water energy requirements, see the ‘PV diversion/Direct PV considerations’ section in this article. There is something of a myth regarding heat pumps and their lack of suitability in colder climates. There are a number of heat pumps available, especially those that use CO2 as a refrigerant, that are suitable for use in climates with even sub-zero temperatures. So regardless of where you live, heat pumps are almost always a viable option—but check the efficiency curve, which is usually part of the brochure or datasheet (if not, contact the manufacturer or supplier) of the proposed system for suitability in your climate. One way to compare the climate applicability of systems is to check the number of STCs that apply to the system in your climate zone (for systems where STCs apply, such as solar thermal and heat pump systems). You can find the register of STCs by climate zone here. The higher the STCs for your zone, the better. Note that there are different zones for solar thermal and heat pumps (cold-climate zone 5 applies only to heat pumps), so you will need to separately determine your climate zone for solar thermal hot water and heat pumps. A table of suppliers and systems is available here. 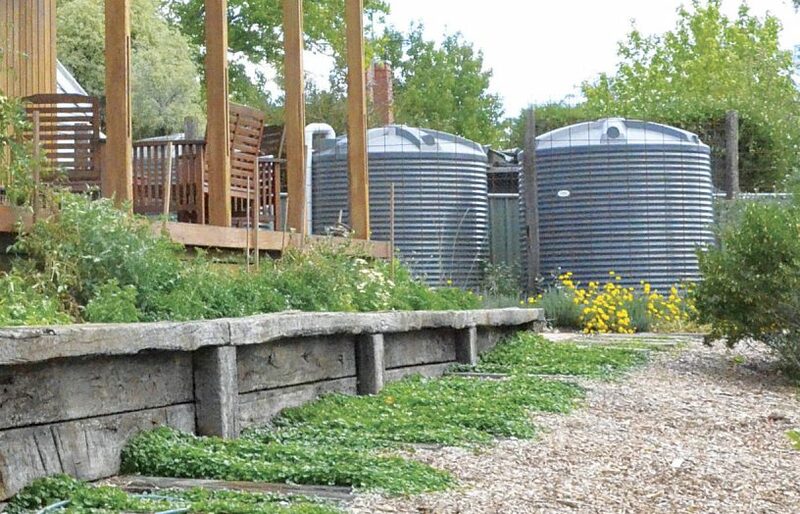 See the full article in Renew 139 for extra information on rebates and STCs; a note on electric instantaneous systems; tanks and tank insulation; tips on using hot water well; sizing your system; and system reliability and simplicity. This article was first published in Issue 139 (Apr-June 2017) of Renew magazine. Issue 139 has a focus on sustainable transport.